Even the oldest highlanders in their wildest dreams could not imagine that someday in the vicinity of the Tatra National Park, on the mountain among the trees will grow such miracles. 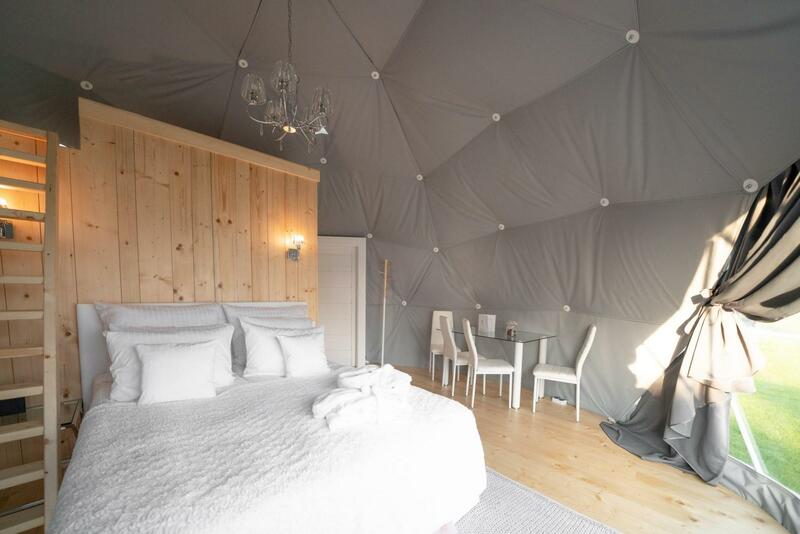 They look like an igloo, have a large window on the Tatras and are as cozy as a hostel in the Hala Kondratowa in the winter. You will find them a short distance from the center of Bukowina Tatrzańska in the company of the mountain and sheep on grazing. There is no one recipe for holiday in Podhale. You can hack Krupówki and bargain for a ciupaga stuck in amber, photograph yourself with a teddy bear, get the highest peaks or leave the tavern. We have a different idea for you. 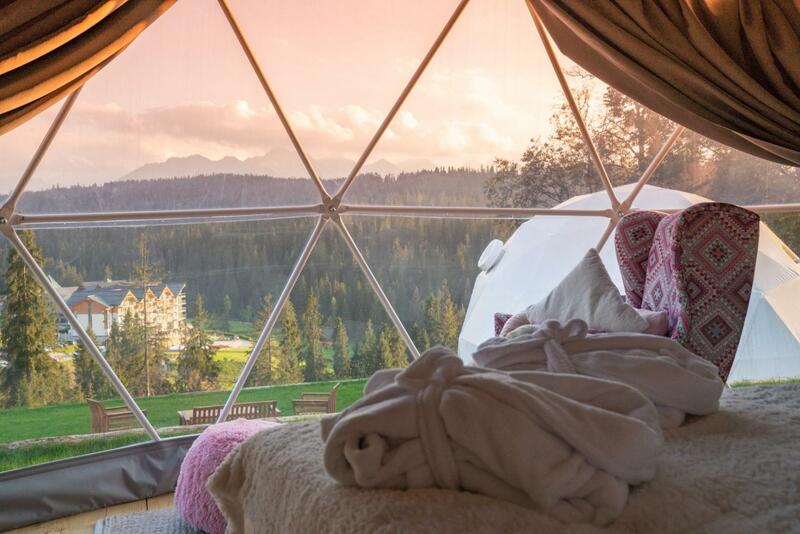 Wake up in fresh bedding with a view of the mountains, bare feet on the grass and fresh coffee with a view of the mountain. 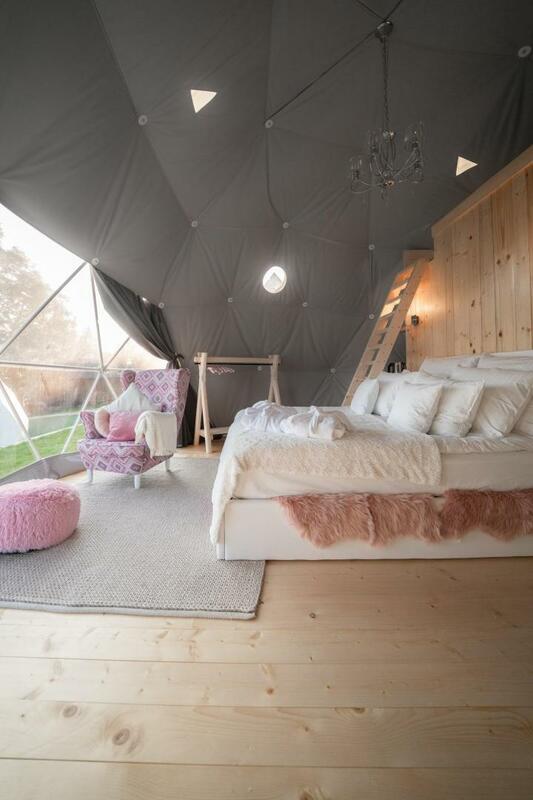 Welcome to the flipflops, that is, a luxurious rest in modern spherical domes. Here the elements of folk architecture combine with modern solutions, and from the panoramic window you can admire the beautiful view and wild animals in the natural environment. Meet the Tatra Mountains in the GLAM version. With the highlanders it is already so that hospitality is in the genes. From my grandfather's great-grandfather, we were taught honesty, infected with a great heart to people and instilling local tradition and customs. All this created an explosive mixture, ie the highlander Maciek and highlander Justyna. 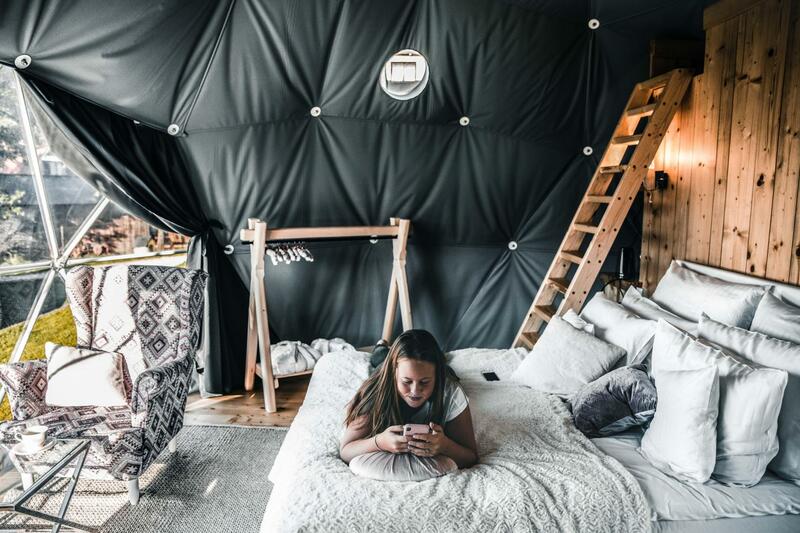 TATRA GLAMP flaps are also accompanied by a hot heart and fiery temperament. We put a lot of passion into it and we want you to look at the Tatras from a different, broad perspective. 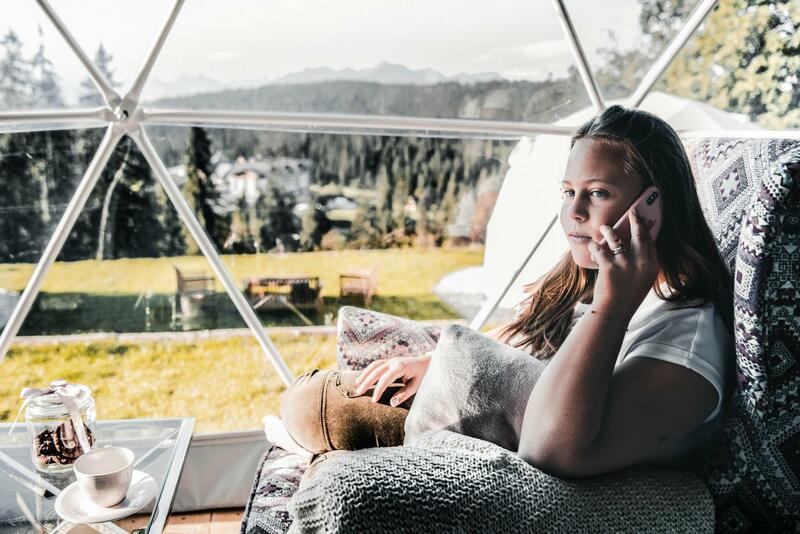 To meet your expectations, we have created a place that is as close to nature as possible, and at the same time provides luxury on the highest mountain level. 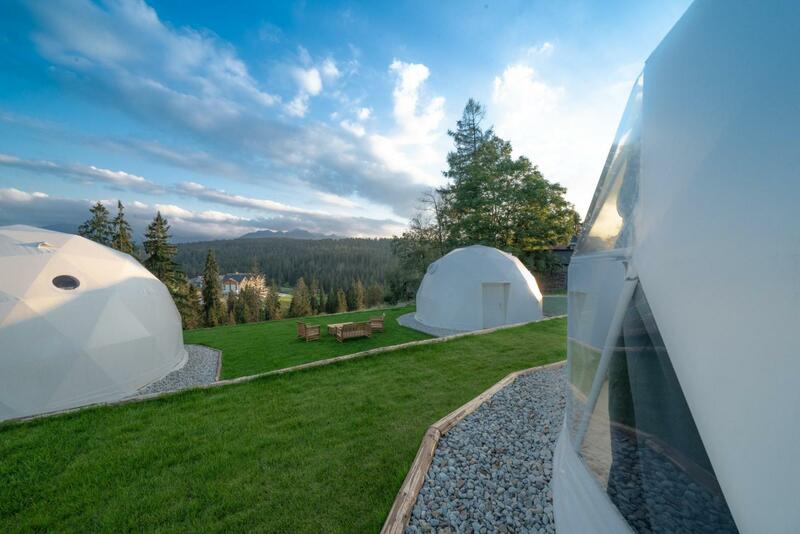 Klapnioki, or modern spherical tents, will provide you with a comfortable relaxation and rest on the highest Tatra level. You do not have to be afraid that the wind will roll over your heads and rain will flood your suitcases. 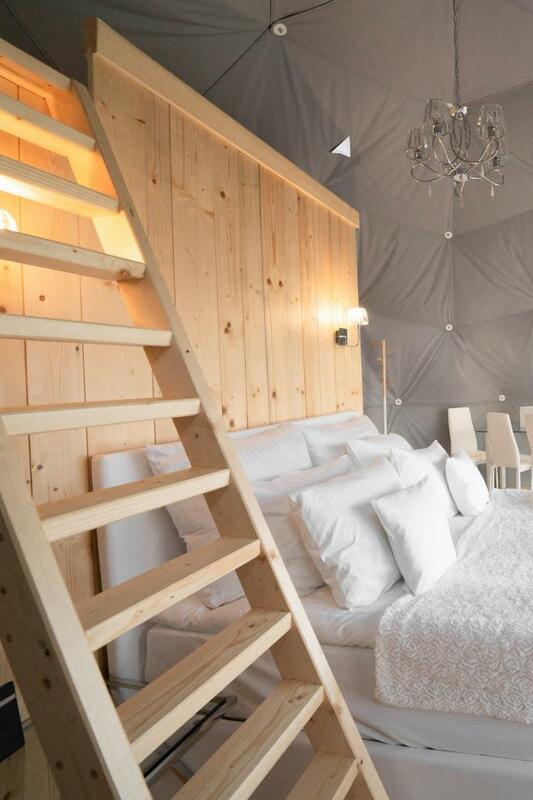 This is not the type of camping. 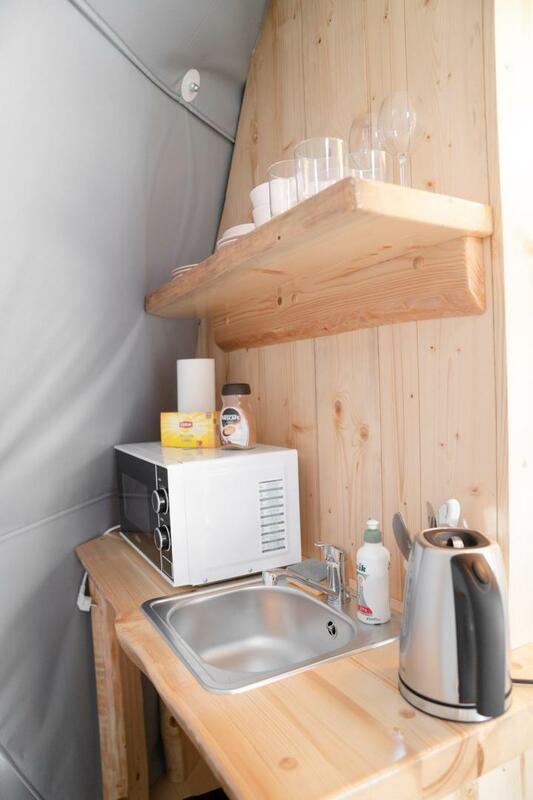 Each tent is equipped with a heating stove... and air conditioner for cold nights and hot afternoons. They are also equipped with a wide comfortable double bed, a mezzanine bed, comfortable armchairs where you can enjoy fresh coffee straight from the coffee machine, a mini bar and a fully equipped bathroom made of ecological materials with a shower cabin. There is also a terrace with a lounge set at your disposal. Getting to us is not so easy, but it's mountains. From the car park located on the main road, you have to go down the mountain stairs and paths. 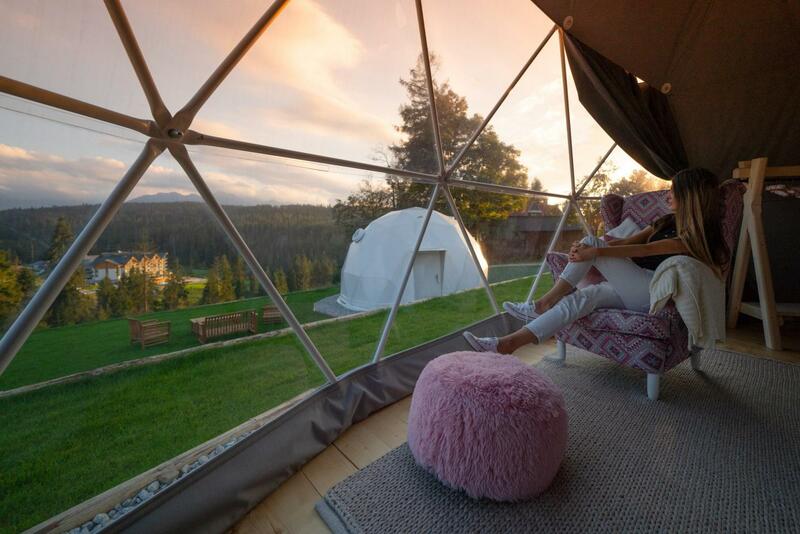 As a reward, four, three-spherical domes are waiting for you with the author's name Klapnioki. - not so wild boar Zika Bronek. 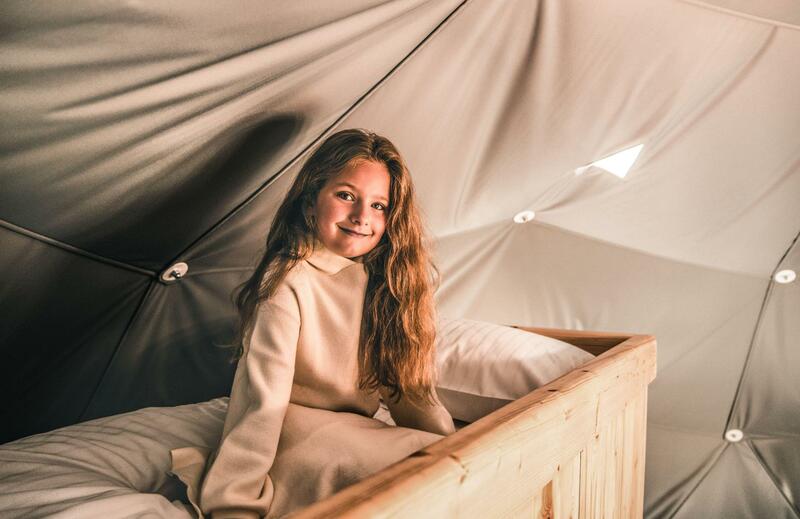 As for a luxurious campsite, snow-white towels, bathrobes and bedding are at your disposal. 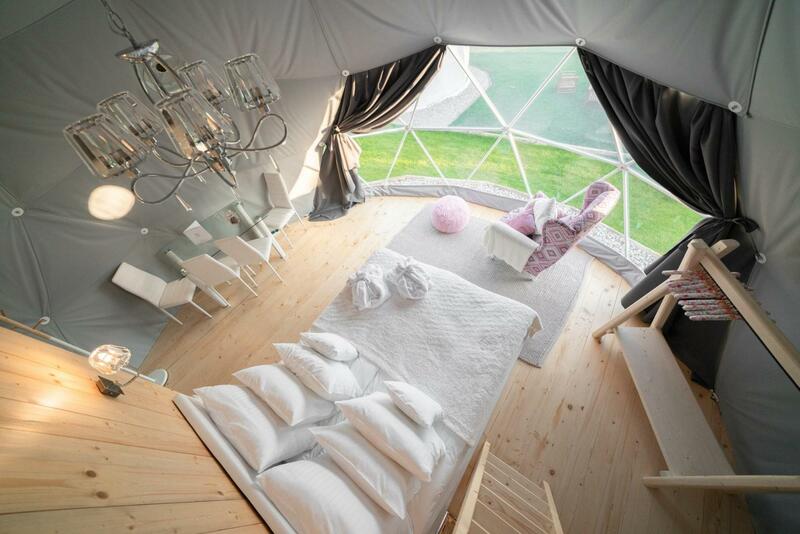 Lighting around the glamping allows you to walk freely also in the evening. 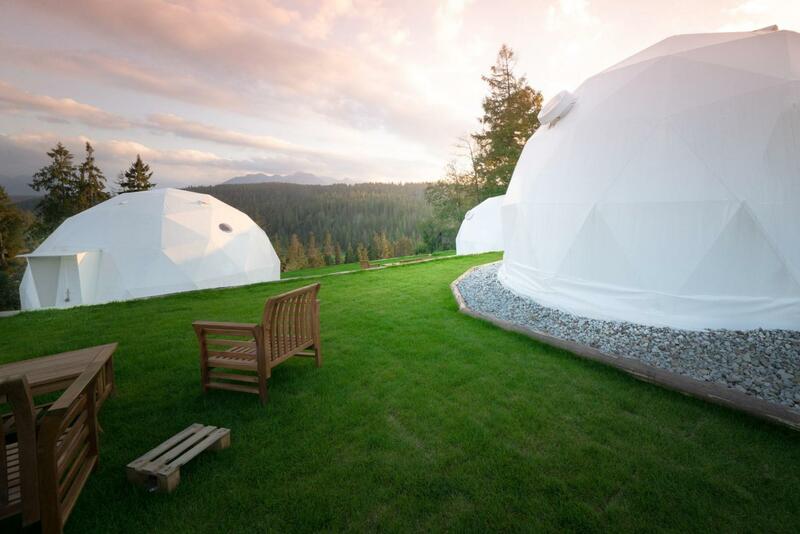 The area below the domes allows evening integration around the campfire with song and a smile on the lips. Imagine having breakfast on the garden terrace in the warm sunshine. You are wrapped in a warm robe, drinking hot, aromatic coffee. 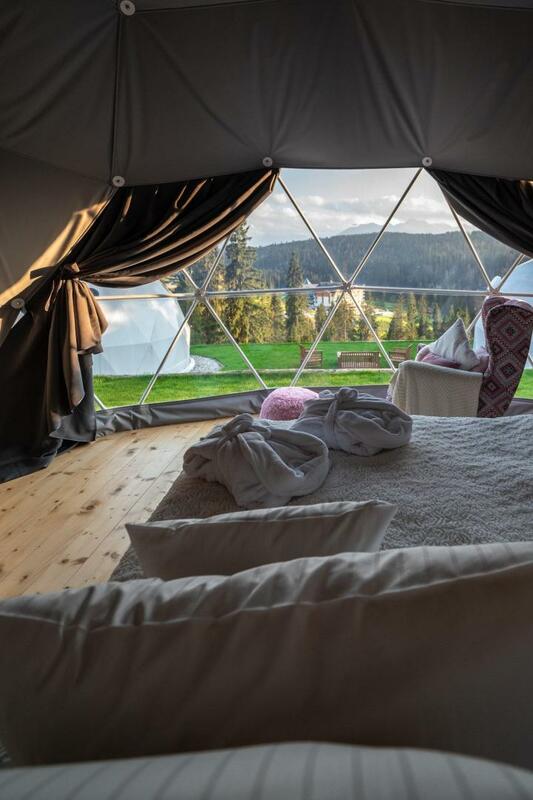 This is what paradise and Tatra Glamp looks like. This is what the scenery of a hand-made breakfast can look like. 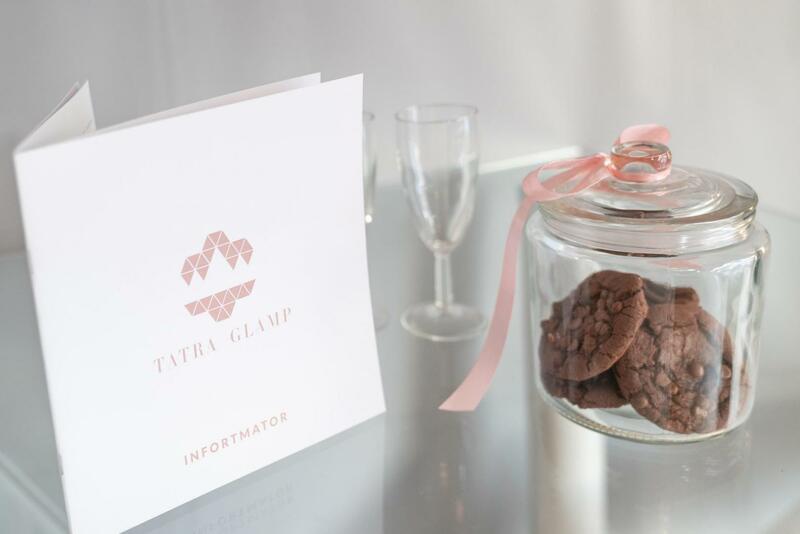 Each clapper is equipped with a fridge, microwave and... kettle and coffee maker, so that the preparation of breakfast was as simple for you as wire. In the nearby deli, 100 m away, you can buy warm bread and fresh products from which you can prepare a delicious breakfast. When you are tired of mountain trips you return to the clapper, you will only think about rest and relaxation. 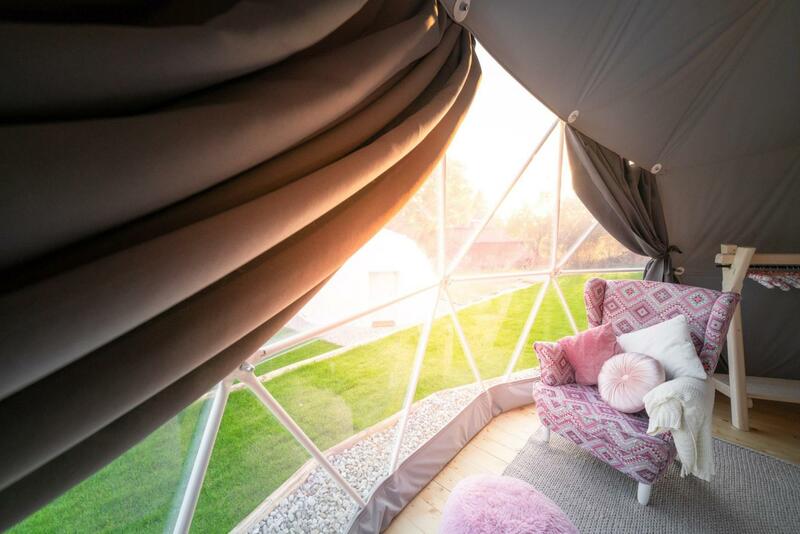 Lying on a soft, large bed, look through the panoramic window and freeze about the Jacuzzi, sauna and swimming pool, or Bukovina's spas - you are lucky. It's only a 10 minute walk from us. Such... luxuries in the highlander edition! If, however, you walk from no-one and you prefer cycling or horseback riding, then we also have an alternative for you. Less than 150 m from here you will find a stud farm, where you can start the adventure with equestrianism. When you feel confident in the saddle, you can get to know the charms of Podhale from the horse's back. Enthusiasts of mountain, road and downhill cycling will find here bicycle routes for themselves. From the famous route of the Royal TDP stage to the gentler forest routes for mountain biking through technically challenging MTB / downhill. In winter, Bukowina Tatrzańska as the cradle of skiing in Poland will provide enthusiasts of skiing: skitour routes, cross-country trails, large ski stations, T-bar lifts, snowmobile terrains. Remember that over the Sea Eye in the evening it gets dark, and the carriages should go to the past, because you can easily walk there. Children in the mountains are like chamois and breathe deeply. Ordinary sticks are ciupagami, and every boy for a moment becomes Janosik. Red beads and a hat with shells are great achievements and holiday souvenirs, just like the stone collected from the route to Morskie Oko. Możliwość rezygnacji do 7 dni zwrot całości zaliczki, poniżej 7 dni brak możliwości zwrotu zaliczki. A wonderful climate place, cozy and beautifully arranged. Beautiful view of the mountains, great location. I was worried about the heating of the tent, but I confirm that the owners made sure that no one staying in it would be cold. I will remember this beautiful time for a long time. A really amazing place. You open my eyes and have a beautiful view of the mountains. From the side of the equipment, it is everything that a person needs. As we spent a few days in winter, where the snow was all around, in the middle it was warm and cozy. Location very good, close to shops, close to mountains and trails.